Hello once again, I am here with another (probably very long, skip to the summary of the discussion part if you just want to be done with this lol) review. Despite the length though, people did seem to like how I wrote my previous review based on the feedback I received on it. With that said, I�ll stick with this new review format/style for a while. But anyway, enough with that. The game I�ll be critiquing this time is articuno360�s latest shooter game, Cinders. Which is, by the way, the second game that (and probably last game I�ll review in a while) I had chosen from the thread I made on the sploder forums. Now delving a little bit into the game, Cinders doesn�t have a storyline to begin with. Honestly, I really prefer games that have stories but I�m fine with those that don�t as well. Not having a story is better than having an overused or bad story to begin with. Despite that however, the game�s description does give the user a bit of an idea on what it is about. Articuno briefly describes Cinders as: �A fast paced action game!�. With a straightforward description like that, I felt quite relieved since I�m not very good at puzzle games. Even the thumbnail of the game seemed to show that the game was definitely going to be action-packed with all the turrets and other enemies and hazards lying about. Its concept in general was quite simple, and plain, if I may add. It was basically just going to be an action game, and though the concept doesn�t really stand out to me, it�s the really the execution of the game that matters the most in my opinion. The design of Cinders was actually quite nice. It didn�t really stand out to me, but it was done neatly and all the design elements complemented the main theme of the game: action. 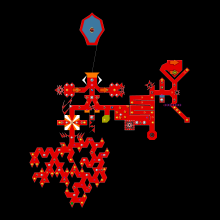 The symmetry and sharpness of the map�s shape, and the polys that helped complement the sharp design of the map was able to really tell the player that this was definitely an action game. Even the intimidating placement of the enemies and hazards made the player feel like they had to move fast or else they�d lose the game pretty quickly. I used the word intimidating to describe the placement of the hazards and enemies because the slightly cramped feel of the map made the player feel that there were a lot more enemies to defeat and hazards to destroy. If the map was more spacious, however, the fast-paced action feel of the game would be ruined. While the placement of the enemies and hazards definitely looked the part, their placements aren�t actually that impressive after you�ve gone through at least one or two attempts at this game. If you moved slowly� which was definitely not the game�s intention� but it was something I just noticed, you�d see that it was actually very easy to take advantage of the position of the enemies. If you stayed and aimed at a certain angle, you would most likely be able to defeat the enemies without sustaining any damage. Even the design elements of the game, such as the polys, made it easier for you to find a place where you�d be safe from enemy fire. This was mostly evident in the first part of the game, if you didn�t move your character after pressing play and during the more maze-like part of Cinders where turrets, speeders and cruisers were in areas where you could hit them freely without getting hurt, and you could even get a crystal or two after doing something as mundane as that. But the maze-like part of the game wasn�t all that bad, in my opinion. It served as some sort of �breathing room� before going to the other portions of the map despite how tedious and repetitive it seemed to be at first. There were actually only a few parts of the game where damage couldn�t be avoided, such as the parts with the disruptor, mortar, and the spider keys. Another gripe I had with the game was the crystal placements of the game, as there were honestly too much objectives to obtain in order to win. At some point, it felt like a chore to be collecting that much crystals. Though, if anything shined through in the game in terms of placements, it was how there was such a good balance of health placements. While it did feel a bit too overkill at first to give the mega health at the beginning, it actually proved to be very useful and well placed, along with the many little health kits scattered around the map. The lack of health kits in some parts of the map were actually really nice as it showed the player that they should have not taken the health for granted, and they should carefully choose when to consume the items. Now you guys might be wondering, who am I to give such judgement to this game? You all might be saying something along the lines of, �But Mash, you didn�t even finish the game! Your name isn�t on the scoreboard!� Well it certainly isn�t, but it should�ve been there. Unfortunately due to how much I wanted to actually finish the game, I had forgotten to log in to my account and I only realized that after I won the game and pranced around, happy with myself until I noticed that I wasn�t signed in at all. :�) But anyway, it did take me around five or six attempts to not die while trying to get the last few crystals and despite what I said a while ago, Cinders was more or less a fun game. It didn�t completely stand out from the rest of the action shooters out there, but its execution was still quite impressive. It wasn�t as fast paced as one would�ve expected given its description, but it was definitely action packed, especially when you hit the switch poly of regret, that will probably make you question why you still continue to exist in this world. :> You might not get that now, but try playing it for a bit and you�ll see what I mean. At first the game does seem quite challenging, especially if you go straight in without thinking, but after a while you can really see how perfectly balanced the difficulty of the game was. While yes, the game was purely focused on action, the game still managed to make you think. The game made you think of various strategies that could keep you alive and the best way to approach every obstacle, which I found very fun to do. In addition, Cinders was able to perfectly blend its difficulty and fun factor to make players want to try again, even though the players would probably be ranting about the amount of crystals they had to get as they played through the game. The crystals did feel like a chore, yes, but it was still quite enjoyable. I reckon I could play Cinders a couple more times before becoming completely tired of it. The only problem I experienced besides the placements� that I had explained earlier� was the lag whenever multiple enemies started to shoot at me. Honestly, I don�t know if the fault is on the game itself, or if the blame is to be put on my very wonderful internet connection, so I�ll let the lag slide as it wasn�t that bad to begin with, it just felt like I was in the matrix from time to time. -Fun to play because despite the concept of pure action being overused, it made you think strategically; it would take a while for anyone to get tired of playing the game. -The difficulty of the game was a perfect blend of easy and hard, giving it a good replay value. -Health placements were on point and helped in giving a good balance to the game's difficulty. -Symmetric and sharp design made the game really feel action-packed. -Enemy placements and placement of some design elements weren�t all that great; the player could easily take advantage of their (the enemies) position and destroy them without taking much damage. -The amount of crystals you needed to obtain in order to win felt like a chore from time to time. -The gameplay was not as fast paced as one would�ve expected. -Not exactly the most creative concept out there; Cinders didn�t really stand out from the rest. Cinders definitely showed a lot of potential as I played the game, as a vast majority of its elements went well together, but it simply didn�t manage to completely stand out from the rest of the many action shooters on this site. However, I definitely give credit to Articuno because it�s really hard to make these types of games stand out in the first place, given that there are so many of the same type already. Nonetheless, I really had fun playing Cinders, which is to me, the most important part of a game, and it was still definitely well thought out and made. It just had a few flaws here and there, but overall Cinders is quite a decent game; although I wouldn�t go as far as saying that it deserves a feature quite yet. Perhaps if Articuno improved on his placements and if he threw in a few new concepts (or if it�s hard to think of one, perhaps he could reuse some and present it better or in a sort of new way) and things, I�m pretty sure he�d have quite a stellar game in no time. Not that Cinders wasn�t stellar in its own way, but perhaps a better balance of game elements would�ve been nice to see.